Description: Original release has "The Mega Cartridge" on box front. 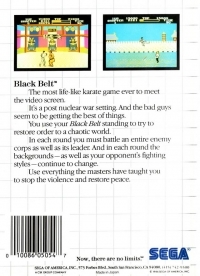 Box Text: The most life-like karate game ever to meet the video screen. It's a post nuclear war setting. And the bad guys seem to be getting the best of things. You use your Black Belt standing to try to restore order to a chaotic world. In each round you must battle an entire enemy corps as well as its leader. And in each round the backgrounds—as well as your opponent's fighting styles—continue to change. Use everything the masters have taught you to stop the violence and restore peace. 10-02-2017 tripredacus Description Original release has "The Mega Cartridge" on box front. 02-11-2016 13aygents Box Text The most life-like karate game ever to meet the video screen. It's a post nuclear war setting. And the bad guys seem to be getting the best of things. You use your Black Belt standing to try to restore order to a chaotic world. In each round you must battle an entire enemy corps as well as its leader. And in each round the backgrounds—as well as your opponent's fighting styles—continue to change. Use everything the masters have taught you to stop the violence and restore peace. This is a list of VGCollect users who have Black Belt (The Mega Cartridge) in their Collection. This is a list of VGCollect users who have Black Belt (The Mega Cartridge) in their Sell List. 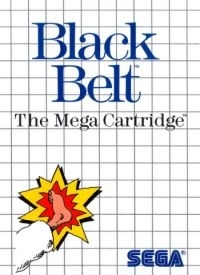 This is a list of VGCollect users who have Black Belt (The Mega Cartridge) in their Wish List.